John Cassaday art. Warren Ellis script. A deranged novelist named Ryu and his men arrive on Island Zero to begin the planning of a revolution against Japan but discover a giant moth. 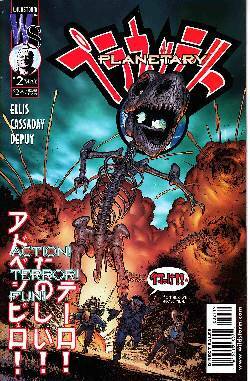 In Tokyo Elijah Snow Jakita Wagner and The Drummer arrive at the planetary office they are informed by a Japanese Planetary agent that Ryu has discovered Island Zero a place that has giant mutated forms of lizards and insects.